The BMW Facebook Page encourages its fans to post pictures and share their driving experience in return for the brand´s latest news, information and entertainment. 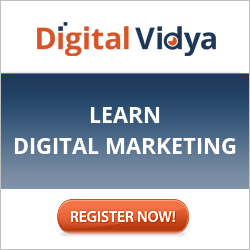 What we can learn from the Facebook industry leader is ….. Car brands usually have a very high budget for their marketing campaigns and activities which enables them to present their car models in beautiful high quality visuals, commercials and videos. Facebook Timeline is all about storytelling and storytelling is all about pictures when it comes to social media. 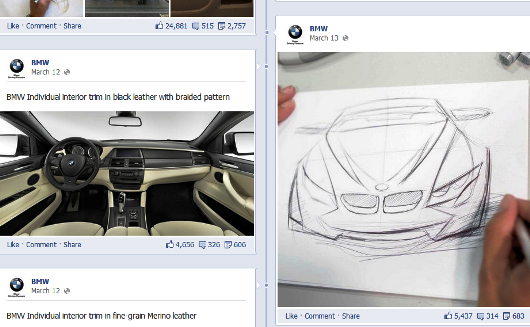 BMW aims to create social networks through as many channels it can by benefiting from social and digital marketing. 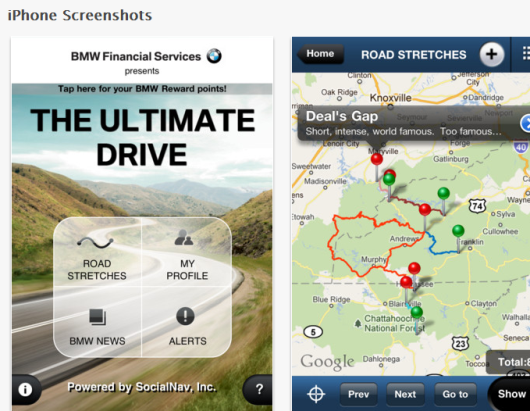 It has released several mobile apps, for example The Ultimate Drive app provides users with road maps where they can mark their favorite drives, leave tips and rate roads. Communities based on hobbies or passions like cars tend to be very strong and loyal. The company also has a customer service team that monitors the buzz on Twitter and Facebook. They look for keywords that can relate to issues with BMW vehicles and try to identify whether the problem is an isolated or a widespread issue. Then the team can step in and alert the dealer network. This is a great demonstration of how brands can use social media to find out what people have to say about their products or services. Plus it enables a brand to get to the problems faster than car dealers or journalists which is always better. BMW launched the “0 to Desir3” YouTube video contest encouraging its fans to submit 5.9 second videos expressing just how much they would love, want and need the BMW 328i in their lives. The deadline already expired at the beginning of March and people can now vote for the best video. And why is it so short? Because this model can do 0 – 60 in 5.9 seconds and it´s a big challenge to fit in a creative idea into such a short period. This was different than the usual contests that would challenge fans more than just by asking them to post the nicest picture or funniest video. It´s always fun to see a product or service from more perspectives and angles. Car brands provide their fans with various content that takes them behind the scenes and into the whole production process. Just being able to see a sketch of a new model, the details of the interior, new technologies or employees in work will make your fans feel like you care about them and everything will simply become personal. When benchmarking BMW to the whole automobile industry using Analytics Pro one can see that car brands in general post a lot of photos and links but they are not very successful in engaging their fans. 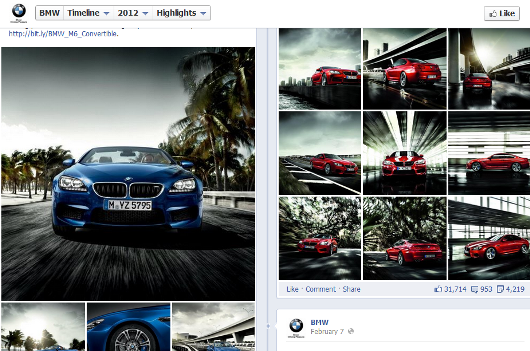 Whereas BMW has very high Engagement Rate numbers – especially thanks to albums and status messages. Definitely a good example. 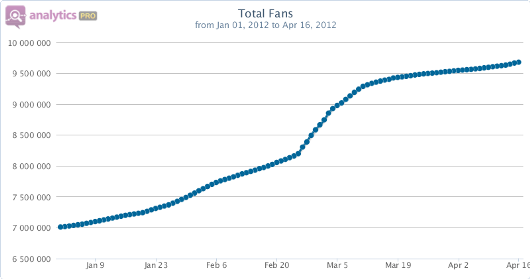 At 11 Million fan base, they have received close to 2% engagement. That is good!